The Powermatic 1791310 PM701 3/4 Horsepower Bench Mortiser from Powermatic is a heavy duty bench top mortiser. The bench top mortiser is a deluxe model that features a 3/4 horsepower motor. The Powermatic 1791310 PM701 3/4 Horsepower Bench Mortiser comes with an in-line depth stop that allows users to stop at preset depths. This is done without necessarily racking the mortiser bit to the base. The Mortiser is operated using a reversible handle. This handle is heavy duty and therefore very durable. In addition, the handle is highly versatile and can be changed from one side to the other quickly and very easily. To add on to this, this changing requires zero tools to effect. This makes the mortiser and easy to use machine. The specially designed double lock system of the mortiser adds benefit to the stock hold down. This double lock system is designed in such a way that one lock, locks from the side while, the other locks from the top. The benefit of this is that there is zero slippage when removing the chisel from the work piece. The hold down mechanism is also reversible and is able to accommodate stock of between 0 and 5 degrees in thickness to be captured underneath it. The Mortiser is powered by a 3/4 horsepower, 115 volt motor, which runs at 1725 rotations per minute. The chuck and head capacity are 1/2 inch and 5-1/2-inches respectively. The chisel center to fence distance is 4-3/8-inch and the chisel capacity stands at 3/4-inch. The mortiser comes equipped with a large hinged chuck door, which allows access to the drill chuck using the standard 4 inch chuck key. A rack and pinion system is responsible for the adjustable fence. For a quick set up, the mortiser has two integrated chisel and bit spacers. This is in addition to the large surface area of working provided by the table and fence. For safety, the mortiser comes fitted with a removable safety switch key. The quick action cam lock will lock the fence in to position quickly with a 90 degree movement. The table size of the mortiser is 11 by 13 inches, while the fence size is 2-5/8 by 12-1/2. The base size on the other hand is 16-5/16 by 13-3/4. The motor current of the mortiser is at 8, 4 amps. 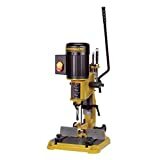 The Powermatic 1791310 PM701 3/4 Horsepower Bench Mortiser is a reliable mortise, however it is not without drawbacks, irrespective of how minor. One of the main drawbacks is that the surface of the table and fence is somewhat ugly. The swirl marks that are dominant on the two surfaces are as a result of the milling process and do not present an appealing surface. Fortunately, there is a solution to this problem. Some users use sheet sanders and was to furnish the surface and make it smoother and more appealing. This is therefore not such a big of a deal among users of this model of Powermatic mortiser. Another minor drawback of using this mortiser is that the handle, though highly adjustable, can cause some discomfort when using. This is especially when working with the narrow stock. The discomfort caused has been blamed on the design of the handle which causes the handle to bottom out of the table before the desired chisel depth is reached. To remedy this problem users have had to put the handle in a very uncomfortable starting position. Nevertheless, this is a minor drawback that has no effect on the efficiency of the 3/4 horsepower bench mortiser from Powermatic. There are numerous other models of bench mortisers for consumers to choose from. However, the Powermatic 3/4 horsepower mortiser might be a great choice due to its durability and ease of use. This unit is heavy and persons who are new to using mortisers may find this unit a bit challenging to use. However, it is still a great piece of equipment. Its many advantages far outweigh the disadvantages. The price is another reason why this mortiser is a great option. Compared to other mortisers of its class and size, the 3/4 horsepower mortiser from Powermatic is quite affordable. Do not be mistaken, the relatively lower price does not in any way compromise its quality and durability. In conclusion, this mortiser is a great value for money and worth every spent on it.